"Ginny has been a God send for me both physically, mentally and spiritually. Yoga has given me an outlet to reduce "stresses" in my life. I feel that the practice of Yoga transfers to my everyday development of "me" in how I relate to my loved ones, co-workers, and the world in general. 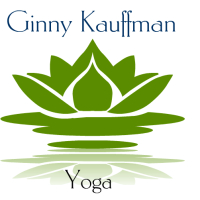 I look forward to being a part of Ginny's classes and I have benefited by being more flexible, developing a stronger core and it has aided in weight loss. Most important is that Ginny cares about each person that comes to practice and encourages us to find "our" best Yoga practice. Thank you Ginny!" - Theora C.
"Ginny put us at ease right away. I really felt that I could begin wherever I was at, (I wasn't asked to push myself hard, or excel; I could just relax, which was a huge relief). She's warm and gentle, and truly wants everyone to feel embodied and connected." - Heather S.